If you are vacationing in the Florida panhandle, plan to stay at the Terrace at Pelican Beach in Destin. Situated along the beachside of Route 98, this private condominium community is near the major city of Destin with various features and amenities in the area. There is a family atmosphere at the Terrace and Big Kahuna’s Water Park is just across the street. The town of Destin has the best shopping and restaurants along with some of the finest golf courses in the state. There are large two and three bedroom condominiums available at the Terrace. 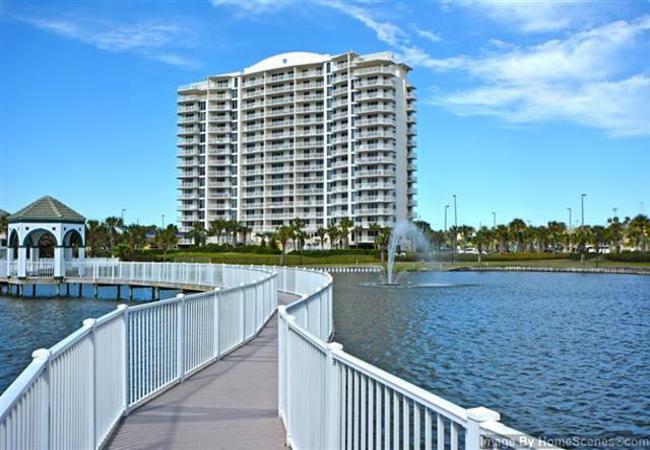 Each one has a full kitchen and a balcony which overlooks the picturesque Gulf of Mexico coast and a gorgeous lake with fountains aglow with light. We offer all inclusive amenity packages for our guests and our rates are fair and competitive. Our gated community has three swimming pools, including a heated outdoor pool with two hot tubs and a spa at pool side. There is also a small pool and a video game room for the kids. For those who like to work out, we have a well-equipped fitness room and tennis courts. There is complimentary wireless internet and access to limited covered parking. If you need to hold a business meeting at the Terrace, we can accommodate with our large meeting facility. Everything you need is right at your fingertips, so make plans to visit today and we’re sure you’ll stay.